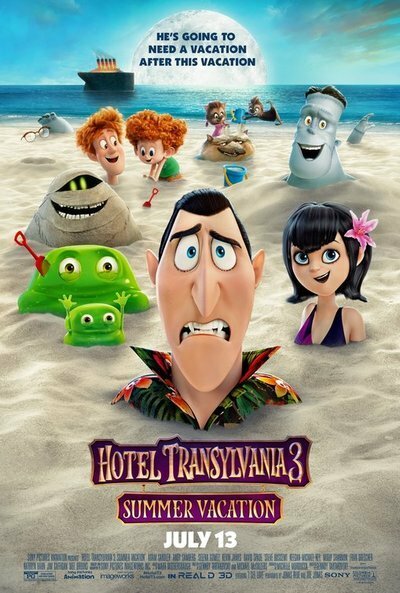 “Hotel Transylvania 3: Summer Vacation” seems designed to answer the question: “Can a movie be hyperactive and dull at the same time?” Genndy Tartakovsky brings back all the fan favorites from the previous two films and sets them all on an overcrowded, doomed cruise, but the thin plot feels less engaging than the previous films and the jokes less inspired. Tartakovsky’s character design keeps things visually interesting for a while, but most people over the age of 12 will check out from the plot midway and start hoping for a cinematic vacation of their own. If you’re somehow unaware of this franchise and yet still interested in a third film in the series, a brief catch-up. Adam Sandler voices Dracula himself, the proprietor of a Hotel Transylvania, a haven for monsters in a world in which they exist more peacefully alongside human beings. Dracula’s daughter Mavis (Selena Gomez) married a human named Johnny (Andy Samberg). The first film was about their Romeo & Juliet union and the second about them having a kid, and dad worrying if he would be human or monster. The third film is the Sandler classic—a family vacation! Mavis, sensing her dad needs a break, books a monster cruise for Drac and his buddies—a who’s who of classic movie monsters that includes Frankenstein (Kevin James), Wayne the Werewolf (Steve Buscemi), Murray the Mummy (Keegan-Michael Key), Griffin the Invisible Man (David Spade), and even Vlad himself (Mel Brooks). No one knows that the cruise is really a trap set by the notorious Van Helsing (Jim Gaffigan) and his daughter Ericka (Kathryn Hahn), but everything gets more complicated when Dracula falls in love with the human secretly trying to destroy him. The setting for “Hotel Transylvania 3” allows for the most Tartakovsky ingenuity in the series when it comes to pure visuals and character design. There are sequences of dozens of monsters in dance crowds or poolside on the ship and one can sense the creator of “Samurai Jack” and “Dexter’s Laboratory” simply enjoying the opportunity to fill in the edges with as much monster ingenuity as possible. Even front and center, the main characters in this series are way more visually interesting than most dull kids movies. It’s long been the best thing about the series. It’s almost the only thing about “Summer Vacation.” The story of Dracula “Zing”-ing when he sees Ericka (that’s what happens when a monster falls in love at first sight) is deadly dull, in no small part because it allows Sandler way too much goofy voice time, but it takes up most of the plot here. Other characters get a single beat or two—Frank gambles, Wayne and his wife enjoy the cruise day care, Murray … no, wait, they forgot to give Murray anything to do—but the movie is constantly swinging back to the Drac/Ericka story and it’s just not entertaining for kids or adults. Every time it feels like there’s an opportunity for the film to do something interesting, such as when they get to the lost city of Atlantis—which should be a place for Tartakovsky’s visual sense to take over but it’s just a lame Vegas riff—the movie swings back to its plot. I never realized that the word "zing" could get so annoying. Trust me, I know that “storytelling” is not the main reason that kids go to third films in a franchise—I have two of my own that love this particular series—but I’m speaking more to the adults who have to pay for the ticket and waste their time here. Kids go for the familiar faces, repeated jokes, and comfortable world they feel they know. “Hotel Transylvania 3” gets enough of that right to allow it to stand above the truly abysmal summer animated offerings of recent years (I’m looking at you, “The Nut Job 2” and “The Emoji Movie”). It’s not that bad. It’s more forgettable than painful. When it was over, I asked my 9-year-old what he would give it. He replied, “I would give it 4 stars but I’m a kid. I’d probably give it 3 if I were an adult.” Not quite.